AStop feeling cramped in your tiny tub! The 72 x 48 EW’s generous dimensions were designed with one bather in mind but can easily accommodate two. A sloping back means you can recline in comfort as you sink down into luxury. Curved armrests smoothly incorporated into this tub mirror the curved edge of the bathing well, adding bathing comfort and a touch of style. A rectangular deck means you can add custom fixtures and keep your favorite bath products on hand. The bowed side walls create more room for you to spread out. 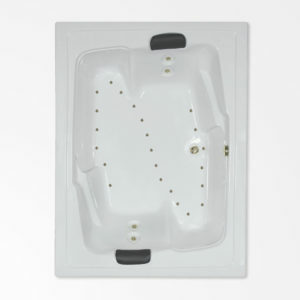 You can enjoy the healthful benefits of soft tissue massage any time you want with the 72 x 48 air bathtub. Five jets soothe tension in your back; four focus on your legs, and two target your feet. Seventeen jets are interspersed on the tub floor for extraordinary bubble action. Fulfill your heart’s desire for wide open spaces when you bathe by yourself or for coziness if you bathe with someone else. The 72 x 48 EW may be just the right fit for your needs. The 72 x 54 tub made its debut in 1988 and remains one of our top-selling two-person tubs. 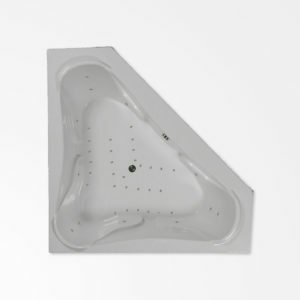 The size of this tub allows each bather plenty of room to stretch out and relax without being crowded. Pillows, sloped lumbar supports, molded armrests, and foot wells for each bather give the 72 x 54 all the luxury you could ask for in a premium tub. Two air injectors are dedicated to each bather’s back, and 23 are arranged in the floor in a Z shape, for a total of 27, and provide a complete hydrotherapy experience. The offset well makes this tub unique and adds a practical feature. It creates greater deck area than squaring the well with the deck, allowing installation of multiple fixtures and faucets and built-in soap dishes. Its shape fits both an alcove and island application, making it a versatile choice. Create your dream master bathroom by choosing the 72 x 54. As you and your partner nestle back into the comfort of all its built-in features, enjoy the peace of mind that comes with knowing that you have chosen a quality product that will last a lifetime. In fact, it’s guaranteed. Being told to go to the corner has never been so appealing. The 72 x 72, our largest tub, will make any corner in your bathroom a welcome retreat. Three seats built into the bathing well allow you to change your vantage point at will. You’ll unwind in contentment as you recline against the molded headrest and armrests sculpted into each seat. Each one has four air jets exclusively dedicated to its bather, so its occupant receives the ultimate in stimulating air massage. Thirty air jets installed in the tub floor inject even more bubbles to the water. Streamlined for simplicity, its clean lines and genuine Lucite acrylic surface are easy to clean and maintain. 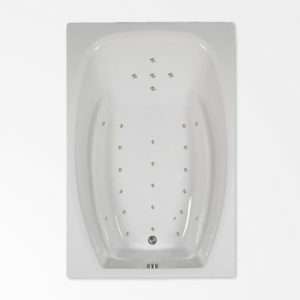 Turn the corner and take your bathroom from so-so to supreme with the 72 x 72 air bathtub.